The peacocks have been unusually shy this year. They can be in the midst of displaying with their feathers all spread out beautifully in an attempt to romance the girls, and as soon as they see me coming with my nifty red camera in hand, they close it up and look at me as if to say, “Keep moving, nothing to see here.” In fact, this is only the second decent picture I’ve managed to snap of either of the boys this year. What’s cool, is that it’s Osiris, the shyest of the boys. . . Score!!! He’s only ever allowed me to take his picture displaying one other time, and that time, he was in the midst of regrowing molted feathers and was, sadly for him, not at his handsomest. That didn’t stop him from showing off to the girls, though. 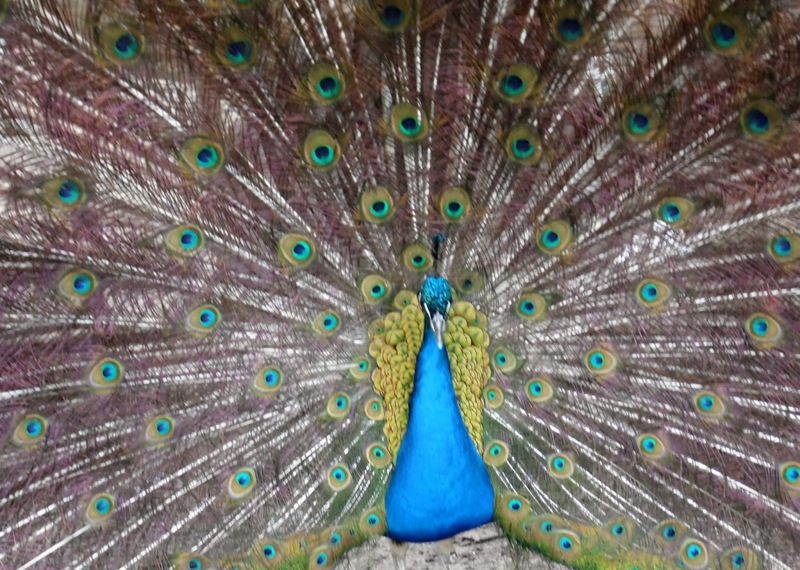 Maybe that’s where peacocks get the reputation for being vain creatures – though I still think Jim Bob the turkey is worse (I swear he could be the inspiration behind “You’re So Vain”). But the boys aren’t entirely alone. The peahens have, in their own way, been shy this year. Last year, during the breeding season, we found our very first peafowl egg of the year on April 2nd (I only know that because I blogged about it here. . . thank God for this blog to keep me on track lol) and by May 15th, we’d had our first peachicks to hatch. This year, they’re completely behind and still haven’t laid the first egg 🙁 They’re not alone, either, as the guineas and some of the geese have been tardy with their egg laying, too. I guess it’s just going to be one of those years. Previous post: Road Trip to PC. Beautiful birds! My grandmother told me she had them when she was a child.